Ukrainian helicopter gunships shot at a Ukrainian military checkpoint in Donetsk Region in the aftermath of a night battle, a video presumably shot by one of the soldiers indicates. 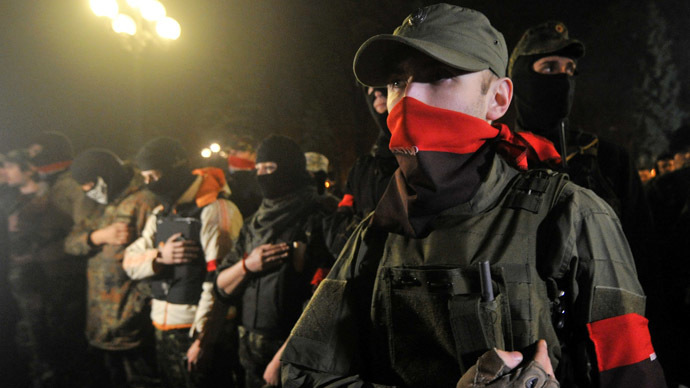 Apparently, Kiev’s troops suffer from gross lack of communications. The eight-minute video on YouTube was shot near the town of Volnovakha in Ukraine’s Donetsk Region, according to the description. 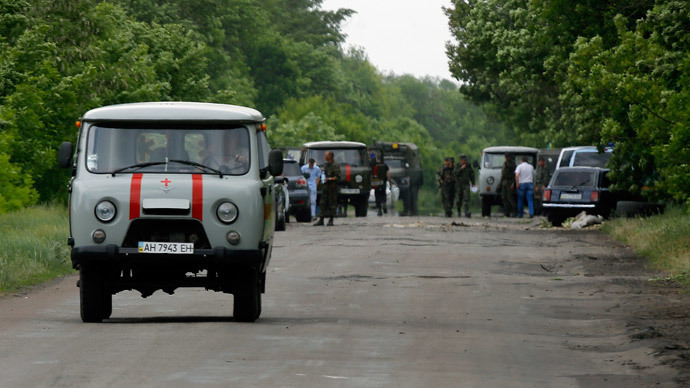 It shows a group of armed uniformed men with Ukrainian army insignia and at least two others in civilian clothes taking cover behind a military truck. The vehicle is at a field and the men are observing from a distance a woodland belt separating on the field border At least two vans are seen and fire burns among the trees. Sporadic gunfire can be heard, possibly from ammunition detonating in the fire, and then a massive explosion erupts at the camp. The soldiers discuss whether they should fall back. 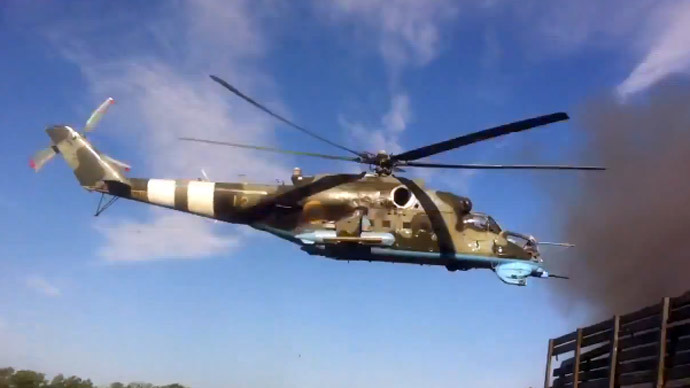 Then two Mil Mi-24 helicopter gunships start barraging at low altitude over the area. After several passes the aircraft start barraging the burning camp from their cannons. “What are their doing?” one of the soldiers exclaims in surprise. “Are they ours?”“Who the f*** else?” another replies. The group hastily flees the scene, but the cameraman continues shooting the footage, cursing and praying as he runs. A couple of minutes later he gets to another woodland belt. He approaches another Ukrainian military man, who is speaking on a mobile phone. Ukrainian troops use their helicopters in the fight against the local armed militias opposing Kiev’s rule to destroy hardware damaged in the clashes to prevent it from falling into the hands of the militias. Miscommunication among the troops could have led to the aviation command believing that the checkpoint was taken over by the militias. The video was uploaded on YouTube on Tuesday, which puts the timing of the video hours after a night attack on the military checkpoint near Volnovakha. The attack may not have been a militia raid, but rather a case of friendly fire, in which one pro-Kiev unit mistakenly attacked another unit. 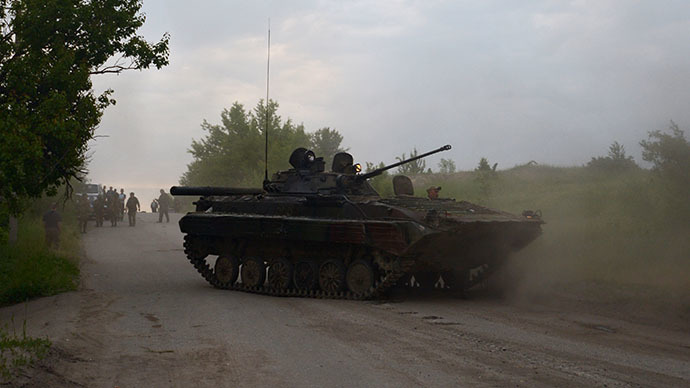 The battle left at least 16 Ukrainian troops killed and 30 others injured.